Recently, a man pleaded guilty to involuntary manslaughter related to a 2008 incident at AT&T Park where an 18 year old was killed. I don't know if alcohol was involved. Regarding your incident, why didn't you or anyone else get security? Especially after being spat upon. Given how many children attend sporting events and how the vast majority of disturbances are alcohol related, I've long believed that alcohol should be banned from sporting events. 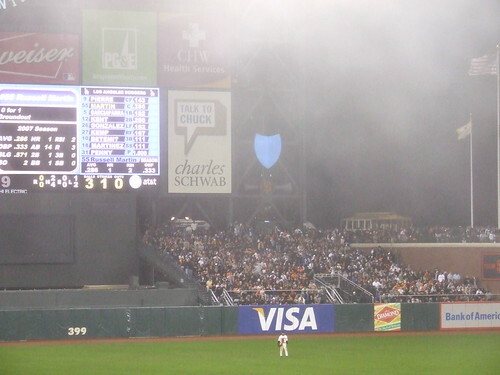 Many drunken spectators have ruined my experiences at Giants, A's and 49'ers games. Strangely, it's never happened at a Warriors game. I've never been to a Raiders or Sharks game. However, that is a pipe dream. Too much money is made selling alcohol at sporting events. As long as alcohol sales exceeds insurance costs, no sports team would consider banning alcohol. The next best option would be to have alcohol free sections of the stadiums and arenas - no alcohol sold, consumed or allowed in the sections. Presumably the ticket price would be higher than the other sections to make up for the loss of beverage sales. Higher prices would give an incentive for fans in those sections to quickly report drunken behavior since they paid a premium to sit in a "drunk-free" zone. I was at the afternoon pre-season A's-Giants game at AT&T Park. Before the game, one of the announcements mentioned that if you have a security problem, you can send a text message to security with your seat location. (Of course, you can also get up and find an usher.) The problem is whether you fear retaliation for reporting the people. I went to the pre-season night game at AT&T and they didn't mention anything about the texting system for security.